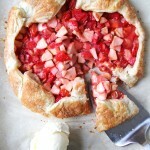 Strawberry, Rhubarb and Apple Galette. This easy and delicious dessert recipe can be on your table in under one hour. All you need is a pre-made frozen puff pastry crust and some seasonal fruit. Oh how I love pie. Everything about it…the crust, the filling…it’s all just so delicious. But sometimes I find making a crust tedious and quite frankly just don’t feel like making a homemade one all the time. But there’s a fix for that. Yes. You can make a homemade pie and skip the step of making the crust. Instead you can use a pre-made puff pastry sheet. 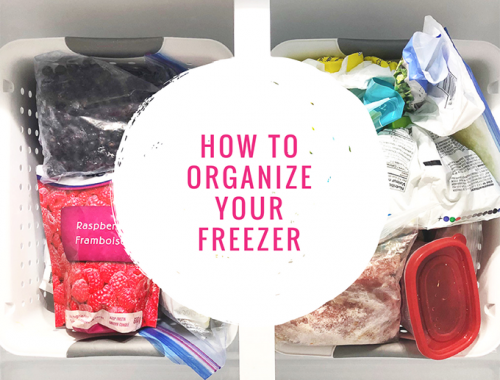 I always try to keep frozen puff pastry sheets on hand as part of my baking pantry so I can have dessert at my fingertips. If you’ve got a frozen pre-made puff pastry crust and fruit, you are 1 hour from a home baked pie…or commonly these are called rustic pies or galettes. They’re not quite the same as a pie with a traditional pie crust, but they are a wonderful alternative. 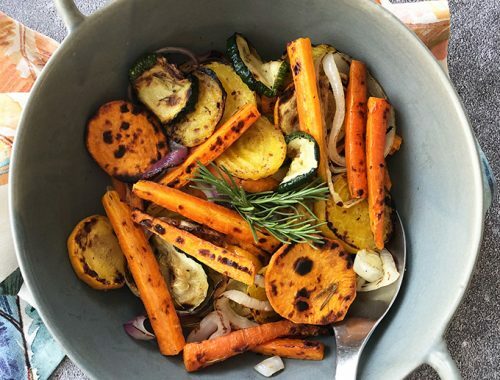 Line a cookie sheet, with a piece of parchment paper. Lightly flour the parchment paper (I actually used icing sugar instead of flour), then roll out the puff pastry to loosely form a circle shape. It doesn’t have to be perfect, this is a rustic pie remember! Set aside. Cut up the strawberries, rhubarb, and apples. (I like to peel my apples). Cut the fruit into small chunks. Place the fruit into a bowl, and mix it with the sugar and cornstarch and let rest for 5 minutes. Then pile the fruit mixture onto the centre of the pastry. Fold the edges of the pastry over to cover the outer edge of the fruit pile. Overlap as needed. In a separate bowl, mix together the egg and 1 tbsp of water. Then using this mixture, brush the pastry. Sprinkle the extra sugar on to the pastry. Sometimes I like to use a cinnamon-sugar mix. Place the pie into the oven, then immediately TURN DOWN the heat to 375 degrees. Bake for 40 minutes, or until the pastry is golden brown. When the pie is done baking, remove it from the oven, and now it is time to add the glaze. Heat up the jelly for about 30 seconds in the microwave, then brush it onto the fruit in the pie (don’t brush the crust). Let your pie sit for about 10 minutes before serving. I like to serve these rustic pies warm with vanilla ice cream. Oh my so delicious! This looks so sweet & delicious! I never would have thought of adding apple to the mix, but it sounds terrific! I’ll have to give it a shot! This looks awesome! I can’t wait for my rhubarb to be ready to pick! That looks great! Our rhubarb is just starting to peek out of the ground. I am waiting for our rhubarb to come up so I can make this! Pinned! Thank you so much for joining us on the #ShareTheWealthSunday blog hop. Hope to see you back next week! 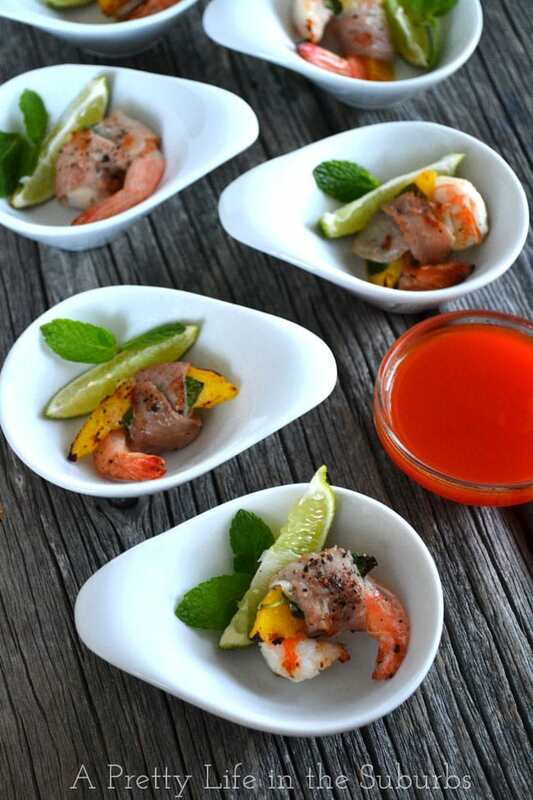 This looks so delicious… I love the combinations of flavors and colors. I’m certainly going to have to make this! Looks amazing! I would gobble this down in no time. Visiting from The Pretty Pintastic Party. Take care! This looks so delicious! Strawberry Rhubarb is one of my favorite combinations! Thank you for sharing this at the #SmallVictoriesSundayLinkup! This galette looks scrumptious! 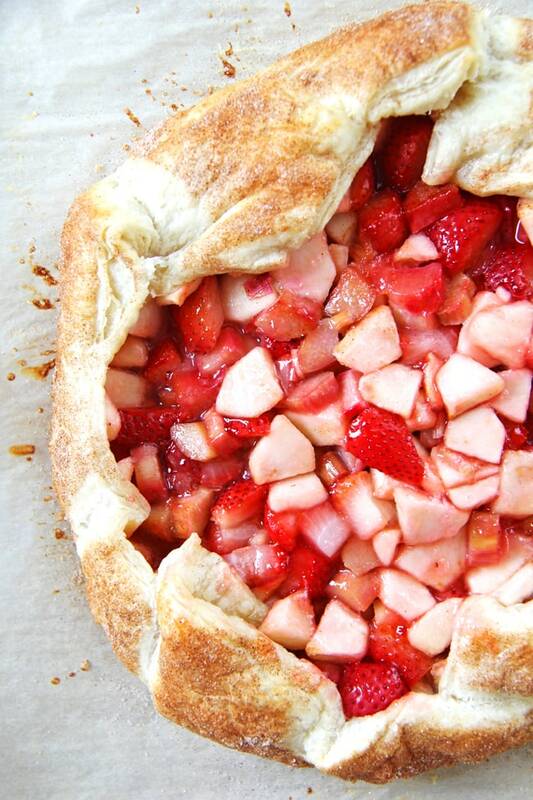 I have fresh rhubarb and strawberries that nee to go in this recipe! I found you at the #PureBlogLove link party. Thanks for linking up! Sharing your post now! This is right up my alley and so pretty! Thanks for linking up with What’s Cookin’ Wednesday! Thank you Karly! And thank you for hosting! Looks amazing. I just made scone with my strawberries I wish I’d come over sooner. Maybe with the next batch I get. Thanks for sharing at the Inspiration Spotlight party! Pinned & shared. Hope to see you again soon. Have a great rest of your week! This looks so yummy! Pinned to my Eat Dessert First board. Visiting from the Wonderful Wednesday Blog Hop board. I honestly just discovered rhubarb a couple of years ago. 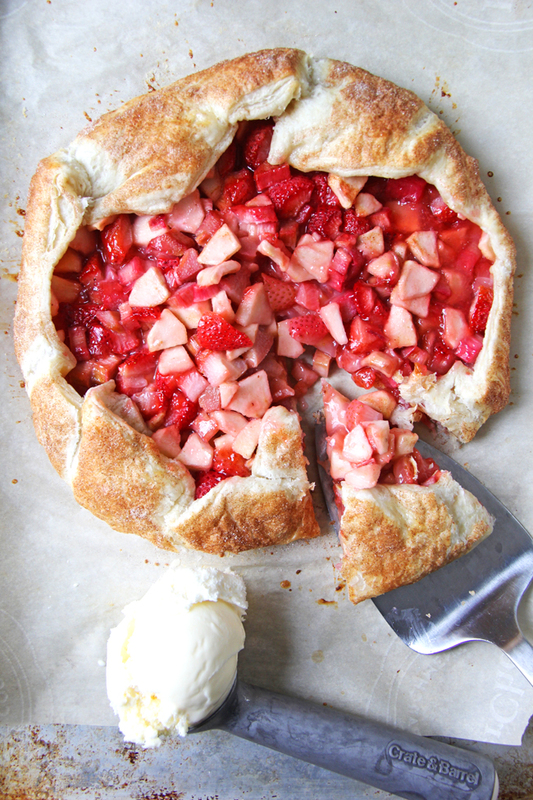 I love anything with rhubarb and strawberries so of course I am pinning this recipe. It looks delicious! Thank you Kirsten! 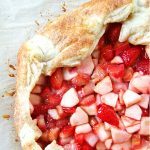 I really love rhubarb – it pairs so well with strawberries! Yum!